More findings from the WYSE Millennial Traveller survey have been published in the new Festivals and Millennial Traveller report. An impressive 50% of the millennial travellers aged 18 or younger who took part in the survey had attended a festival in the previous year. The Festivals and the Millennial Traveller report provides a snapshot of millennial traveller festival spending and preferences for a great festival experience, such as cheap food and drink, big performing acts and, believe it or not, clean toilets. The most favoured locations for a festival were reported to be ‘close to a big city’ or ‘in the mountains’. Also of note is millennial traveller spending on festivals; as total trip spend rises, so does festival spend. Thirty percent of festivalgoers spent EUR 100 – EUR 200 on a festival while 21% reported spending EUR 200 – EUR 500. The peak age group for spending was 26 – 29, who spent on average EUR 231 on a festival. 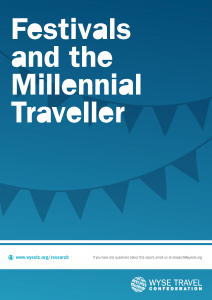 Festivals and the Millennial Traveller, a report from the WYSE Millennial Traveller series, is available free of charge to members of WYSE Travel Confederation. Not a member? Check out the WYSE membership options or purchase a copy for just EUR 24.95.